I’ve always been a bit afraid of announcing the really good stuff that’s going on, for fear of somehow jinxing it away. For example, it was months after Jeff & I started dating that I really started telling people he was anything other than “another .net boy” and I still am sort of reluctant to talk about exciting things like building a house (yes, there’s another post there, still to come). The big news in my life is that I have a puppy. As you may recall, I had an experience before Christmas that led me to believe that I *might* be able to have a puppy, which is something I’ve always always wanted. At the start of this year, “Investigate Pomeranian” made it onto my (always way too long) To Do list. After calling around a bit, we found a breeder (Cindi Wolfe, of Wolfe Kennels) in Graham who had just had a litter of Poms and who was happy for me to come meet them. The following Saturday Jeff and I headed out to Cindi’s and I got to meet India, who was only three weeks old. (OMG!! TEH CUTE TO KILL YOU!!!!) She fit into the palm of my hand and after snoozling a bit fell asleep in my arms. To tell the truth, I was a bit hivy and sneezy during the visit, but there were *bunches* (seven?) of dogs (and not all Poms) so it was really hard to isolate what was going on. I enjoyed meeting Cindi, though, and I knew that she understood how much I wanted this. She even agreed to let me come back and visit as many times as I needed to in order to make sure that I really wasn’t going to swell up and die. A few weekends later we went back and visited again…the somewhat (to me) odd thing was that I had *missed* the little puppy after that first time I met her. At that second visit, Cindi (who went so far above and beyond that it’s almost impossible to describe) said she’d even bathe the little girl with the allergen-reducing shampoo and keep her away from the other dogs so I could meet her uncomtaminated. The pictures from that visit are here — you can’t see it, but I did hive up when she licked me on the face. Not insurmountable, as you can teach puppies not to lick. Other than that, no major issues. Five days later I picked up India(2). She’s a handful, but then as I understand it, most puppies are. It’s sometimes really frustrating because we don’t know what she wants. She will cry, and we’ve no idea why, or she’ll be absolutely running around mad, and there’s no rhyme or reason to it, it seems. A learning experience for me, for sure. I love her muchly and hope it works out. Everyone keep their fingers and other appendages crossed for me! (And if you want to meet the world’s cutest puppy, let me know! She’s had her last puppy shot, so she can now socialize with other dogs (as long as they’ve had their shots). I don’t know whether this is common or not, but when everyone seems to suffer from the same affliction I do, I tend to minimize the seriousness of the affliction… I think to myself “Oh yeah, allergies…everyone has allergies. I’m probably over-reacting and being a fuss-budget. So at least I’m not a crazy hypochondriac! (2) India because she’s black like India Ink. Her whole name is India Friday (for the Steely Dan song “Black Friday”) Wolfe (for Wolfe Kennels). She’s a feisty little girl — and soooooo fuzzy! she is adorable! Looks really playful. I love the photo of you in the green shirt holding her. I hope you can overcome the evil allergies! Playful is an understatement. She’s a tasmanian devil chock full-of-energy. Perhaps we could have a puppy playdate sometime. I’m not sure that would work so good — Thirteen is aged and has no tolerance for energetic puppies. Her idea of a play date is to sniff a little and then lie down :) Jane isn’t hostile to other dogs, and it’s possible that a puppy might bring out her playfulness, but she’s 65# and there’s a chance she might step on India :) PLus both my dogs are heading into their spring shedding phase and being around them probably wouldn’t be good for you. Still, I’d love to see you and meet India. yay puppy! fingers crossed that it goes splendidly. I am so envious. 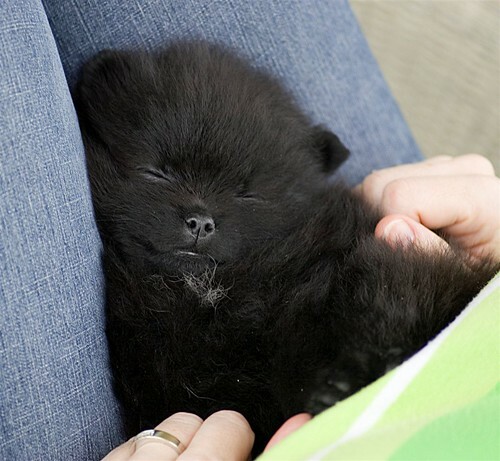 I grew up with Poms and if I ever get a pet again, I want it to be a Pom. I can’t resist wanting to pet any pom I happen to run into. They make me melt. You do have the worst allergies I have heard of so you are not being rediculous. Considering what little you have said about your physical reactions, if anything I think you are playing them down. Since I can’t have dogs in my place and I am not sure I am up to that care and attention a pet deserves (I have been killing plants lately) right now, I give to you my current karmic allotment of a Gina with a pom. That’s a very good idea about the licking — she seems to not mind (much) being redirected to my fingers, and they don’t hive. Toes may be another option. Thank you *very* much for the karmic allotment of Gina’s with Poms…if you’re ever Eastward you must come meet her! India is such an adorable little fuzzball! (And when I say little I mean tiny since I’m calibrated by Heidi for one Standard Pet Unit (SPU) to be a 80 lb. dog. *grin*) I really enjoyed meeting her and look forward to coming to visit again soon. I know you’re not exaggerating on your allergies. I remember the time you got hives on your knees — through jeans! — from kneeling on a carpet in a house o’ cats. I have allergies. You have _ALLERGIES_. I’m crossing my appendages for you!